Last night Gordon Brown sought to infer that it was individual Labour candidates who were writing their own literature with claims about Tory cuts, and it was nothing to do with him , guv. 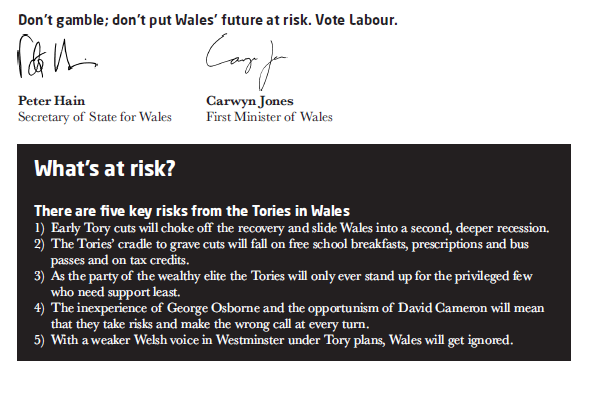 This is from page 2 of the Welsh Labour Party manifesto. A clear assertion that the Tories will cut prescriptions and bus passes. Will they now withdraw this, or apologise? Please. This is no more specious than the Tories bald assertion that the NI rise will cost tens of thousands of jobs whereas efficiency savings are cost free. This is not a road the Tories want to go down. With Nick Robinson having confirmed that Tory HQ called in journos from the Mail, Sun and Express to feed them Clegg smears which we saw in full force yesterday and with several senior Tories having pleaded that they had nothing to do with it, the word "hypocrisy" springs to mind. At least Labour's leaflets are on policy rather than grotesque personal attacks. I acknowledge that Iain called the press out on that but no Tory has yet acknowledged their shame at orchestrating it. Play this card at your peril. Well, they didn't apologise when caught out sending leaflets that said cancer patients would be more likely to die under a Tory government, did they? So there's not a chance in hell they'll apologise for this. Labour: complete and utter ████s. I'm expecting Gordon Brown to turn up and kill my goldfish at any moment. I've checked the Labour manifesto and there is nothing in it about goldfish or allowing them to remain alive. What do you expect. Hain signed it. Please. This is no more specious than the Tories bald assertion that the NI rise will cost tens of thousands of jobs"
You an economist, then? Are you the CEO of a multi-national company? Are these hissy fits that David Cameron all too frequently has the product of manufactured or genuine outrage? I don't know which would be more worrying. And as for all this 'I demand satisfaction' style pomposity, well. But two months ago the Tories launched a highly spurious anti-Labour poster campaign with a gravestone on it. That's gravestones in a campaign aimed at the elderly. Fear-mongering? please, there are no high horses in this field. This cannot be so, I heard a BBC national radio reporter assure us this morning that these were all things said before the GE campaign started. So he (the bbc reporter) said we should ignore lies made before the GE started! Considering it looked very much like Cameron made up the policy commitment to keep free eye tests for pensioners during the debate (it's nowhere in the Tory manifesto), the leaflets made fair claims at the time they were published. To be honest he's not the only one lying to us. Last night Dave did terrible trying to answer on the EU. Smeargate , Nick Robinson uncovers the truth that it was orchestrated by Tory HQ . It appears that one of the conversations went somwthing like . Tory HQ rep - We really need you and other Conservative leaning newspapers to attack Clegg in the next couple of days . We have a number of stories we can give you . Brogan or other Smearograph rep - No thanks we are on board but we have our own story ready to run with . Perhaps a Tory might intrude on the Labour love fest here? Brown implied, not inferred, that Labour constituencies were doing this on their own. That is untrue since a great many constituencies report these lies in Labour election material as well as lie that the Conservatives will abolish Sure-start. Cameron and Gove have said very specifically that we will retain Sure-start, pensioner bus passes, winter fuel allowance as well as undertaking to restore the link between earnings and the state pension. Local newspapers have been inundated by outraged women writing in to worry people by the story that Sure-start will be killed off. Cameron infers that these are all deliberate Labour tactics devised by the hounds of hell and in that he is absolutely right. The chances of truth in any statement whatsoever made by any Labour politician are remote. I think if there is a tory government (I know, I know but just imagine) and they don't do any of the things they're currently pretending they won't then we will indeed owe them an apology. This exactly 1979 when Thatcher claimed she was being smeared by those who said she'd put VAT up. Perish the thought. Your party has form for this. btw did anyone else think Lightweight's hissy fit last night looked a little over rehearsed? Well I believed it. I still do. ...Tories launched a highly spurious anti-Labour poster campaign with a gravestone on it. A Labour poster first you say? What a marvellous poster reminding people of governments commitment to transport and the right to travel freely. Designed by a Briton too. A red car for a Red government. In other news nothing in the Tory manifesto about not shooting a rocket of poor people into space! How could they! Well, are they going to cut free breakfasts, bus passes and prescriptions? Isn't Hain just an ordinary joe seeking re-election as an MP?. As Westminster has been prorogued he ain't a Minister of State, so isn't the leaflet mis-leading, false and breaks the rules.? "Please sir it was not me, a big boy wrote it and ran away........"
In one word 'NO'; Labour never apologise for anything they do, just for things that happened more than 50 years ago. Brown lies. It's what he does. He obviously doesn't know any better otherwise he wouldn't do it. I guess that his moral compass needs recalibrating. Hopefully he will have plenty of time to attend to that and to ruminate upon quite why he was able to fool quite so many people for quite so long. Maybe the people he fooled will also take the time to wonder why they were quite so gullible for so long. The "grotesque personal attacks" of "Smeargate" orchestrated by "Tory HQ". What? Either Clegg did say that the British people have a 'more insidious cross to bear' than Nazi Germany over World War II or he did not? Either Clegg did have donations to his political party paid into his personal bank account or he did not? Some newspapers who are not pro-Liberal Democrat run stories that are critical of Nicholas Clegg? Shock! They should be banned! Of course "do what we say not what we do" is the rallying cry of Tories throughout the years. I fail to see how this is any different from what you are accusing Labour of doing. Those without any class may say that it amounts to lying - but i'm afraid it has been a part of politics for a long time for policians of all hues to fill in the gaps on their opponents statements. I have one, but you should get hold of Mark Tamis election leaflet to believe the scaremongering and negativity. It makes this look like an endorsement of the Tories. That's like the pot calling the kettle black"
I'm not going to pretend there isn't a grain of truth in that, but we're not the ones feigning outraged innocence are we? I don't always find myself agreeing with NuLab, but this time what they say is reasonable. Those things are not mentioned in the Tory Manifesto. That means they will be cut. End of. Will he sack candidates who have made this claim that he has now admitted is a lie? This story and thread sum up a very odd aspect of the election - lots of the issues under discussion at UK national level are in fact DEVOLVED powers which means that Dave, Gordy and Nick can say what they like but they would have no actual say at all on a topic if it is devolved.